It's the closing meeting of the 2018 Kent Speedway season on Monday (8th. October) with the annual staging of the Kent Laurels. The individual meeting was resurrected at Central Park Stadium in 2013 and is contested for the WJ Cearns Tropny - competitions inaugurated respectively in 1939 and 1952. With a heritage dating back 79 years, the Laurels event can rightly claim to be the longest running individual Speedway event outside of the World Championship and the long lost WJ Cearns Shield (dating back to 1952) which reappeared last year will be presented to the winner of the 12-man field as well as a £300 cash prize. The amazing story of the lost trophy which made a dramatic reappearance after being missing since the first year of the 1980s will be revealed in an article in Monday's meeting programme. Five of the Kent SLYDE Kings side from a successful 2018 season, which saw the team finish runners-up in the Travel Plus Tours National League [TPTNL] and reach the semi-final of the Knock-out Cup, compete individually before the curtain falls on the 2018 season: former GB British Champion (at Youth level 10 years back in 2008), Nathan Stoneman; in-form Anders Rowe (fastest heat winner last Monday); another in-form high scorer in recent weeks, Alex Spooner; skipper Jack Thomas; and Taylor Hampshire are the home quintet looking to keep the Laurels title in Kings' hands. Luke Bowen was the winner last season (sadly injured and so unable to defend his hard-won title) - and Bowen having succeeded other previous Kent captains, Stevie Boxall and three-times winner Simon Lambert as Kent Laurels' winners, there's clearly some expectation on current incumbent, Jack Thomas (who's had excellent individual pedigree this year, 4th. in both the GB U-19s and the National League Riders' Championship) to emulate his esteemed predecessors. Seven visiting riders complete the field: three from rival TPTNL sides and four competing under the 'unattached' tag (i.e. having had no 2018 club). 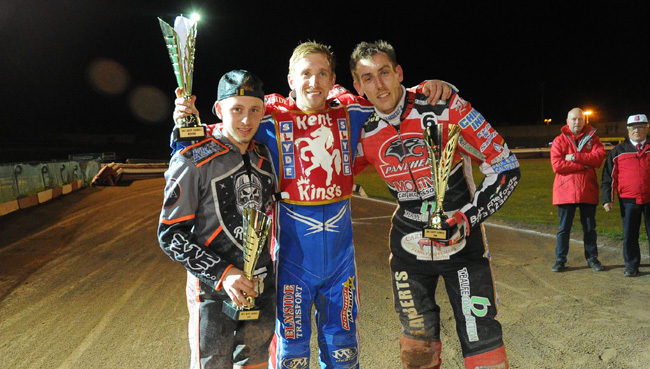 The first of these really can't be described (other than technically) as 'unattached': Luke Clifton is a Kent Speedway club loyalist and Kings' rider until serious leg injury stopped him in his tracks last season, The hugely popular Clifton will finally make his track return at Central Park on Monday. Evergreen TPTNL stalwart, Jon Armstrong, in his Testimonial season, has reached another set of Play Offs with his 2018 club, Coventry Bees. Very popular as a visiting rider among the Central Park faithful, 'Armo' last competed in the Kent Laurels in 2014, finishing fifth on that occasion. In his third Kent Laurels is home county man and former Kings' rider, Danno Verge, who has spent 2018 with the Isle of Wight Warriors has been in good form when visiting his former track, including in recent weeks as a 'Guest' for Belle Vue Colts and Lakeside Hammers. Travelling all the way from Exeter is a rider with a fully-deserved reputation as something of a Kent track specialist, Richard Andrews The Plymouth Devils' captain's performances have been top quality in terms of points gathering and endeavour, making him one of the outstanding visiting riders of the season at Central Park. To many observers, the highest class rider at TPTNL level without a team place throughout this campaign is 29-year-old former Oxford & Rye House rider Kyle Hughes. The rider from Bath has also ventured into the world of motorcycle Road Racing and his exploits on the tarmac have sometimes been the cause of the odd hiatus in his Speedway career. Hughes is believed to looking to make a Speedway track return in 2019 and very much in the shop window in the Kent Laurels. Talking of the shop window, GB Youth rider Daniel Gilkes is the 16 year old many are talking about as the youngster most likely to succeed in 2019. And with three race wins when he rode in what's to date his only senior competitive fixture, as a Lakeside Hammer against Kent at Central Park last month, he actually enters the Laurels as someone many fancy as a real dark horse. If young Gilkes is at one end of the age range, at the other is GB Veteran Championship holder and former Arena Essex racer from the 1990s, Rob Ledwith. Hammers' fans reeling from the loss of their Raceway home in Thurrock will doubtless be fascinated to see the 46-year-old with over 100 appearances for the Essex club on this dramatic comeback appearance. The action gets underway at 6.30pm on Monday (8/10) and following the action will be the 2018 farewells and presentations in the Central Bar.